Subscribe to comments with RSS or TrackBack to 'Rule 5 protection analysis for 2016'. I think Voth and Marmolejos are the only locks. I may be crazy but I’d add Skole also. Bautista is a nice speedster but he doesn’t feel 40 man worthy and I’d risk him – I’d sooner protect Read, but we can’t potentially have 5 catchers on the 40 man. Also, what about Nick Lee? He was outrighted mid-season IIRC but has had a nice run in the AFL. So, I didn’t consider anyone drafted in 2011 who is still hanging around honestly. That includes Skole, Ramsey, Norfolk, Pleffner, Turnbull, Hill, Nick Lee, Bryan Harper. I guess because the team had MORE than enough chances to add any one of these guys at the 9/1 deadline and did not. Skole a perfect example; we’ve argued about him a ton but who is guaranteeing him a roster spot when he’s nearly identical to a whole slew of 4-A 1B types? Nick Lee: 4.32 ERA while repeating AA; doesn’t that trump a handful of innings in the AFL? Lee and Skole seem like the types of guys who would get taken. I’m not high on Lee, but perhaps the AFL seems like a big step forward?? I do like Skole and want to see him compete for Clint’s spot – if he loses, we should probably get rid of him anyway and let Marmolejos and Ward man the AAA corner spots. Of note, the Nats currently have only 32 guys on their 40-man roster, so they’ve got a lot more flexibility than they’ve had in recent years. Sorry, but I’m not spending a slot on Bautista, particularly with Stevenson burning up AZ. I wouldn’t be surprised if they protect Marmolejos. He’s got the bat to have a chance at sticking on an MLB roster, even with his lack of positional flexibility. I won’t be upset if they don’t add him, though, and I’d think the odds are that he wouldn’t get picked. You didn’t mention Nick Lee, who I assume is exposed since he got DFA’d. It wouldn’t surprise me if they re-added him, particularly with Bryan Harper having had some sort of arm surgery. They just don’t have a lot of lefties in the upper minors, or with the big club. Skole; a good point. So the team has 2 days to decide whether he needs to be protected so that he can even have the chance of competing with Robinson next spring, or trust in their evaluation of him as a player after seeing him in MLB camp multiple times. I guess it depends on how much they’re looking to replace Robinson. I just took a look at Nick Lee’s AFL stats. 1.64 ERA yes .. but 9 walks and 10 hits given up in 11 innings!! I bet his FIP is triple his ERA. Its the same reason they DFA’d him … too wild to be effective. Sorry, seems I was writing at the same time everyone else was. I also thought of Skole. Eh. Leave him exposed and wish him well if someone picks him up. They didn’t even bring him up this year when Zim was on the DL. OK, you talked me out of Lee. So for me, it’s Voth and maybe Marmolejos. Should be an interesting decision the team faces on all these guys. I’m not “anti Skole” necessarily, just trying to read the tea leaves. were it me, i’d protect a ton of guys now and then just axe them if I needed the space. Surprised you guys don’t like Bautista as much as I do. Understood he’s very similar to Stevenson .. but man he’s a speedster. He’s also similar or inferior to Robles, Perkins, Goodwin and MAT and feels like Eury Perez. Seems like we have enough speedy, light-hitting CF types in the system. Certainly wouldn’t be terrible to protect him, but I don’t see him having a viable path to the big league club. I’d be looking into replacing Clint. He can’t play a position and his hitting isn’t good enough to justify keeping him IMO. Skole feels like Clint with a glove. The Skole love continues. There is zero (-0-) chance that he would be taken in the Rule 5 draft. His bat is solid, but he’s not fast, a good defender (I’m not sure why anyone thinks he’s a better defender than CRob) or position flexible, so he’s a crappy option for 25th man. To qualify, his bat needs to be great. It isn’t. Each of the past few years there is hue and cry that the Nats should protect him or lose him, the Nats don’t protect him, and no one else picks him up. I believe the deal with him is that he can elect minor league free agency if not added to the 40 man roster. Voth is the obvious lock, as all concur. Even with Robles, Stevenson and Soto OF is an obvious need for the Nats (Robles and Soto are years away still) and I think that works in Bautista’s favor. Marmalejos-Diaz I think gets added also, but mostly as a precursor to a trade. Being designated Nats Minor League PoY is pretty much a trade flag. The 1 player I would be intrigued to take if available is Phillips Valdez. if you’re a lousy team he would be worth a look plus he cxould be easily stashed in the bullpen for the year. Todd, the problem if you add players to the 40-man and then ax them later is that in the DFA you expose them to waivers, where they can be claimed without having to be kept on the MLB roster all year. In other words, they become much easier to claim than they would have been in Rule 5. Doing this probably cost them Bostick, who likely wouldn’t have been a Rule 5 pick. I’m tired of the Skole discussion and don’t want to revisit. CRob’s career minor-league OPS was .891. Skole hasn’t been above or near that number since he was in Hagerstown in 2012. CRob crushed for many years at AA-AAA. The comparison isn’t close. That doesn’t mean that the Nats may not look to improve over CRob; it just means that Skole isn’t that improvement. Bautista has been debated several times on Luke’s site. He does have his champions, who see him as the next Billy Burns. I’m more in the “next Eury Perez” camp. We’ll see. KW: fair point on waivers. But here’s at least 3 guys on the 40-man now who I think could be waived and may not even get claimed: Revere, Grace, and Martin. To a slightly lesser extent Goodwin and Gott; i think the jury is still out on these guys. would you cut Revere, Grace and Martin so that you could add 3 of these marginal guys? Probably not. But the room is there in case you buy a FA out of the blue and need the room. The appeal of him is that he is our only guy in the system who might surprise by cranking out a lot of HR’s. 24 HR at Syracuse is not that bad since it’s not a great HR park, especially the first couple freezing months of the season. The downside is nothing as Clint hit .235 with a whopping .332 slugging in over 100 games this year. So KW by your comparison, anyone who rakes in the minors like Clint did is on target for .235/.332 in MLB. We all know that’s not true, and the floor for Skole and many other blocked prospects can’t possibly be much lower than those stats either. I’d give Skole an opportunity in that spot and he’ll probably match Clint’s season HR total (5) in the first month. If he fails… we should still feel good about giving a longtime system guy a shot, is cheap, and can be dumped without regrets. Anyway… I’m not so much a Skole advocate as I am an advocate for giving all our guys who have been plugging away in the system a fair opportunity. Give them the same shot to fail and K 1000 times a season like Taylor, Espi, and Desmond got. I got lots of pushback and these same incorrect minors-majors projections on Goodwin, Difo and Turner last year, and none of them embarrassed themselves. Some guys thrive in the minors environment and some promising guys go stale there because they are tired of being stuck down there forever. Bring back my boy Max Schrock! ha ha I’ll trade Taylor for him even up right now. Todd owes me a drink if Schrock cracks the majors next year for the A’s. BTW Todd…don’t agree that Goodwin or Gott are anywhere close to release candidates. They may be two of our very important pieces next year. I’m hoping these cheap promising MLB ready guys will be big contributors if we unload some talent to get a sure thing like Sale. Why is it that Clint Robinson is presumed to have a ceiling of his .235/.305/.332/.637 when he put up a .272/.358/.424/.782 in MLB the season before? Where Skole is presumed reasonably likely to exceed Robinson’s numbers in MLB despite not having exceeded Robinson’s numbers in the minors? That’s faith based thinking, not analysis. Goodwin had 44 plate appearances, mostly in September, and Difo had 66 plate appearances, and pretty much all of his production was in September (.593 OPS August; .927 in September). Because of hte increased rosters and differing priorities for non contending teams, September stats are notoriously unreliable even beyond sample size. Here’s another September warrior you may remember: Matt den Dekker. Raking in September of 2015 didn’t make him someone that he wasn’t. The same is very likely true for Difo, Goodwin and Severino. The Nats could bet on a repeat or improvement – but it would be a dumb bet to make. Mike Rizzo, I implore you, for the sake of the sanity of all Nats fans, PLEASE make a trade soon so we can talk about something other than the merits (or lack thereof) of Skole and Bautista! So you think Dendekker’s skills just vanished after he was called up for one game and hit a hero game winning homer? Or do you think he got sour in the crap hole of Syracuse after showing in 2015 and his hero call up this year that he deserved to be on the MLB roster over the entitled Taylor etc…? Were Difo’s middling minor league stats this year reflective of skill or did he go sour after many good years in the minors and a few tastes of the bigs where they wouldn’t even play him? Goodwin looked like he finally turned the corner in the minors and in his 44 plate appearances did not express the horrible looking ab’s that Taylor has been flashing for 2 solid years now. And those 44 and 66 ab sample sizes for Difo and Goodwin were doubly encouraging since they did not beg for excuses like we always make for Zimm, Harper, Revere etc.. that they need 100 ab’s in the bigs just to get their strokes and timing back to get a couple hits. What Clint has proven is that despite being a massive human being, he has no dependable power stroke. So for a bad glove, no speed singles hitter who performs better starting than pinch hitting, he doesn’t have much value. Goodwin and Difo can at least run after they get their singles with 10X better gloves and positional flexibility. Dendekker would have had more HR’s and much better speed and defense. Skole has the potential at least to jog around the bases a bunch of times. I’d just like to see how he performs in MLB now a couple years removed from that horrible elbow injury, and see if he could outperform not just Clint, but also the current version of Zimmerman. Those are not very high bars right now in a system devoid of power and more leaving via Ramos. They are free to try! They might get hot for only a month which is as good as anybody on the roster could muster this year other than Murphy, Rendon and Turner. Worst case is they strike out 100 times in a row, get sent to the minors, bat .205 with .291 slugging in the minors, then get called back up anyway like Michael Taylor. Gotta consider these guys at least for platoons and bench. I’m not at all suggesting we should not bring in a legitimate star hitter as a regular. But if you’re going to get one, get a real star that is not an expensive player on the decline. We already have those at a few positions. Or get Sale which would virtually guarantee another playoff berth at minimum. I’m not saying that CRob has much value … just that Skole has even less. Tyler Moore was a much better minor league hitter than Skole ever was, and Moore has done pretty much bupkis at the MLB level. I don’t trust psychoanalysis via the TV and the internet, but if you want to go with the “weighed down by bitterness” angle, OK. As for MdD, it would have more weight if it didn’t fly in the face of the fact that, other then September 2015, he has never been a good hitter at the MLB level, and not all that great at the minor league level. But people believe the damnedest things. There are some people who still pine for Steve Lombardozzi, for goodness’ sake. As for Difo and Goodwin, I’m not advocating a DFA for either of these guys. Difo is still a mid-level prospect with question marks; Goodwin put himself back on the fringe of prospect status and will need to follow it up in 2017. If I were the Nats I wouldn’t plan around these guys, but they’re certainly worth hanging onto for now – especially since (I believe that) they still have minor league options. Quick interjection; i did the Options analysis for our squad and only 2 people have options issues this year: Robinson and Solis. Lobaton had options issues last year but achieved 5yrs service time so he can decline the option. I may or may not put the data into a post for the hell of it at some point. McCann to the ‘stros for two low-minors arms with high ERAs. Looks like they just basically gave him (and his contract) away. I wasn’t keen on him (and his contract) for the Nats, but I didn’t know that the price would be basically nothing. Oh well, I’m still holding out for Vogt. I think it would be a big gamble to go into the season with the Seve/Loby combo. That is exactly my point. if he is a prospect, how can he ever prove himself now if he doesn’t get to play? You have to play a little in the majors to find out. More dead time in the minors is worthless. I’m not saying they are all stars. Just give them their chance like Taylor, Souza, are getting at the MLB level to prove themselves in or out of the league. Some people here didn’t even want to call Turner up because he stats weren’t as good in the as Seagers. ALL OF YOU thought Goodwin was absolutely going to embarrass himself if he got called up when I suggested it early in the season. Dendekker thing is the entitlement problem with this team for years. he has a great September and we reward him by dumping him to the minors. He hits hit a game winning homer on one day call up, and we dump him back down and keep Taylor up. Stras starts every opening day when Gio deserved it off great year one year then Zimmerman deserved it the next year. Zimm has amazing year capped by no hitter then doesn’t even start game 1 playoff? Espi won’t even try to fix his contact big swing issues and we keep playing him. Werth thinks he’s the coach. Entitlement all over…. There has to be reward for success in the majors and minors. Reddick to the ‘stros for 4/$52M. Scratch him off the possible wish list. His time with LA gave me pause, though. The market is starting to heat up! And Trout wins! The AL got it right for once. The NL, not so much. Bravo to the one brave soul who gave Murph a first-place vote. While we’re sort of talking about potential CRob upgrades, here’s a thought: Logan Morrison. He’s 1B/LF so could spell both Zim and Werth. He didn’t have a great year last year so should be reasonably priced, maybe ~$4M per or so. He wouldn’t be a cause for cartwheels, but he strikes out less than Moss, is younger, and would probably cost half as much. Another option would be to re-sign Drew and give him some time at 1B and LF in the spring. He’d be the cheaper Zobrist. I like both those ideas. Drew’s deserved to be starting SS most of the games this year at SS if he didn’t have the vertigo thing. Nice finish to the AFL for Voth. 15 straight scoreless IPs. So I’m predicting a trade for a closer. I don’t see the Nats paying $12-15m/yr over 3-4 years for someone. Turner is the trickier question – gut tells me that they’d like him in CF as an easier position to allow his hitting to flourish. But organizationally they have Robles coming and nothing equivalent at SS, so without getting a longer term SS in a trade, they have a hole. Yet the market is offering mor OF options than SS, so they are likely to move him back to SS. Reports collected on MLBTR suggest that the Rays are floating Colome, who isn’t even arb-eligible yet and is controlled for four more years. You’d have to pay a good price for that much control, though. I would think they would want something the level of Fedde + a couple of second-tier prospects. I know how much a guy like that would help the Nats, but if I’m Rizzo and I’ve already got big arms like Glover, Lopez, and Solis, I’d still find it hard to part with a major prospect for something I might be able to cover in-house. Tough call from where I see it. I’m having trouble getting on the Sale bandwagon for the same reason. The Nats already have good starters and have more pressing needs elsewhere, namely catcher, SS/CF, and closer. As for Voth, very glad that he’s been able to finish strong and re-establish some value. It’s time to move him. The Nats have sat on guys like Cole and Jordan past the time they had peak value. Don’t do the same with Voth. I’ve said for at least three years that he’s going to end up with the A’s. The A’s are dangling guys like Vogt, Doolittle, and Gray. Let’s do some business with our old friends. Wow they kept everyone, including Skole! Very meaningful that Skole was given a chance and that the team invested a roster spot in him. Heartiest congratulations to him. It means nothing more than validation that he ought to get a chance at the major leagues with someone, which is what Marty and I have been saying all along. As for the others, Read is a surprise. But they invested in him. 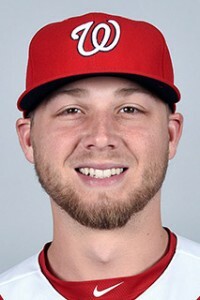 My read is that the Nats view him as an emerging bat who is poised to take a big leap in AA, and if he comes around defensively as a catcher, can make it or be a valuable chip. The Nats have a lot of room to trade quantity for quality and can add free agents as need be. Better the Murphy variety (starters) than the McClouth version. Holy cow I can’t believe they protected so many! Great for them. Marty will be sooooo happy they protected Skole! Just posted on the newest post that the Skole party is at Marty’s. John C. and I aren’t invited, I’m sure! I’m really surprised they added more than three or so. Read is nowhere close to ready defensively, not close enough at all for another MLB team to pick and carry him. Read isn’t Nieto . . . who, by the way, hasn’t been back to the majors since the Chisox squirreled him away on their bench for all of 2014. Weirdly, Heisey has disappeared, despite the announced re-signing. With Heisey, they have 37. Heisey: Saw something on Zuckerman’s article that indicated that it wasn’t “official” yet, but yeah 37/40. Here’s my take on the depth charts now. First off if space is needed: Revere, Grace, Martin, then you have to say the loser of Skole/Robinson ST battle. So how do we read the tea leaves? Did the Nats add so many guys because they aren’t planning to sign many FAs? Or trade a few folks on the 40-man? Or at least non-tender Revere? The Bautista addition plus Stevenson’s strong AFL would seem to make Revere’s spot more tenuous. My bet is a trade is brewing. A Gio-type 4 for 1 trade. Wally, regarding Turner at CF or SS… I think you play him wherever he wants to play which is probably SS, unless he proves he can’t handle it. Why jerk him around? The kid is probably a star or superstar. Turner position; he grew up playing SS, he was a 1st team all american in college at SS, and he was drafted as a SS. He’s also far more valuable as a shortstop to the team. He should be playing SS. So many protections to me says Revere is done and maybe a couple others (by my estimation, Grace and Martin too; if they went out and traded Schrock to acquire Rzepczynski instead of giving Grace a try late last year, perhaps that was indictment enough of his capabilities even given his good 2016 numbers in AAA). Revere hit .217/.260 in 103 games and we still won the division by 8 games. Ted Lerner is probably saying Bautista or Stevenson can’t do any worse than that if they started right now, so save the money. What do you guys think of getting Sale? if we’re not getting a legitimate superstar bat, don’t you think it would be more valuable to add him and have the best rotation in baseball dealing every day? I just can’t see paying the big price to get Sale for an area that’s not one of need, particularly when there are areas of need: CF (or SS), C, and closer. I wouldn’t hate it if they did it, but it seems to me like they could get more mileage from investments elsewhere. To me, the Chisox port-siders who would do more to improve the Nats would be Eaton and/or Robertson. If it’s me, I’m building a deal with the A’s around Voth plus a little more (Marmalejos?) for Vogt. Then I’m giving the pitching-starved Angels Gio, Cole, Danny, and whatever else for Simmons. With the salary saved, I re-sign Melancon. I also sign Logan Morrison to be an alt starter with Werth and Zim. To me, a construction along those lines improves the team a lot more than strengthening an area like starting pitching that’s not really one of need, and giving up three or four super prospects in the process. Here’s my thought on trading for Sale: its not the right approach to winning in the modern era. Kansas City won by having awesome defense and an amazing bullpen and running out (frankly) a bunch of #3 starters. Chicago had better starters of course, but they really only had a good top three. They won on the backs of (again) good defense and by trading for the best closer in the game. Both teams had better offenses than we did. The Dodgers made the NLCS with basically two starters. So, squinting at Scherzer, Strasburg, Roark, Ross and Gio … yes Sale is an improvement over any of those back three (and arguably over Strasburg since he’s so frequently injured). And he’s lefty. But he doesn’t give you payroll flexibility (unless you moved gio as we’ve talked about a ton) and it only really gets you part of the way to the solution. We still have shaky defense at a number of positions as is (LF, CF, 2B, 1B, C) and no Andrew Miller/Aroldis Chapman type. If it were me, i’d be focusing on improving areas of obvious need, not trying to build the best rotation known to man. What did it buy the Phillies when they had the “best rotation ever” in 2011 with Halladay, Lee, Hamels and Oswalt (and Kyle Hendrick as the 5th it should be noted)? the same 3-2 NLDS loss we just had. The super rotation the Mets built took them to a WS in 2015 yes … but now that rotation looks in complete injury-riddled disarray one year later. I just don’t think you can “start” your way to playoff success anymore.